I'm a fan of Bristol based graffiti artist Banksy's work and I'm also a fan of DubStep so finding this video called Banksy vs Dubstep posted on YouTube by narcotect a few weeks ago was a nice moment. Unlike dubstep star Burial (real name Will Belvin and 2008 Mercury Music Prize nominee), Banksy is just about still keeping his anonymity intact. I also found this video which is a trailer for 'Living Inside The Speaker -Dubstep: Bristol' a 37 min. documentary focusing on the scene in 'Dubstep's 2nd city'. So how do I connect Banksy with Burial? Bristol is "Dubstep's second city". Dubstep is what you hear when you listen to Burial and here's a great track from Burial's Untrue album called well 'Untrue'. 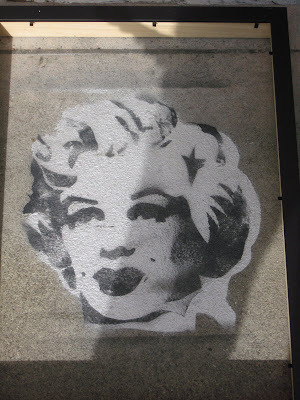 Here's my photo of a Banksy on the pavement outside The Hospital 24 Endell Street, London earlier this year. I walked past there the other day on my way to work and there's not really much left of it now, I guess everyone's been walking on it and it does seem to rain a lot in London, even in the Summer. Banksy and Burial. Burial and Banksy, two gifted individuals who's psuedonymns both begin with B. Now wasn't that a pointless thing to say, time for a cuppa. If you would like to use any of the photos on this blog, you are free to do so but please give credit to this blog. Bristol has always had a cool music scene. I love dub.